Do you know what makes a glacier...a glacier? I didn't, until I read Bill Guyton's 'Glaciers of California'. Guyton takes what might be a dry subject and turns it into a fascinating study of glaciers and their many features. Glaciers offers an in-depth history lesson detailing past ice ages and glaciation in California. 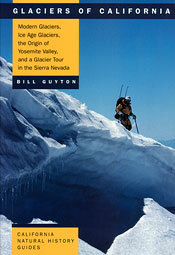 Additionally, the book identifies and describes the many glaciers that remain today in California's mountains. It's quite enlightening to learn how crevasses, seracs, ice horns, and other glacier features actually form. Beyond the satisfaction of sheer knowledge, however, this information is invaluable in helping mountaineers understand and assess risk when traveling glaciated terrain. Learning why crevasses form, for example, teaches us how to predict where they will form, which can be especially useful in early spring, when most crevasses remain hidden beneath the snow. Glaciers of California features numerous black and white and color photographs of glaciers and glacially-carved terrain, identifying the difference between a U-shaped and V-shaped valley, for example, and explaining in detail how a cirque comes to be. Specific sections address modern glaciers, ice age glaciers, the origin of Yosemite Valley, and a 'glacier tour' of the Sierra Nevada. It's a wonderful book, and I highly recommend it as a valuable addition to your mountaineering library (in case you're still wondering, a permanent snow pack becomes a glacier when it gets thick enough for its weight to overcome internal bonding and flow downhill).